Sweet, sweet papaya. 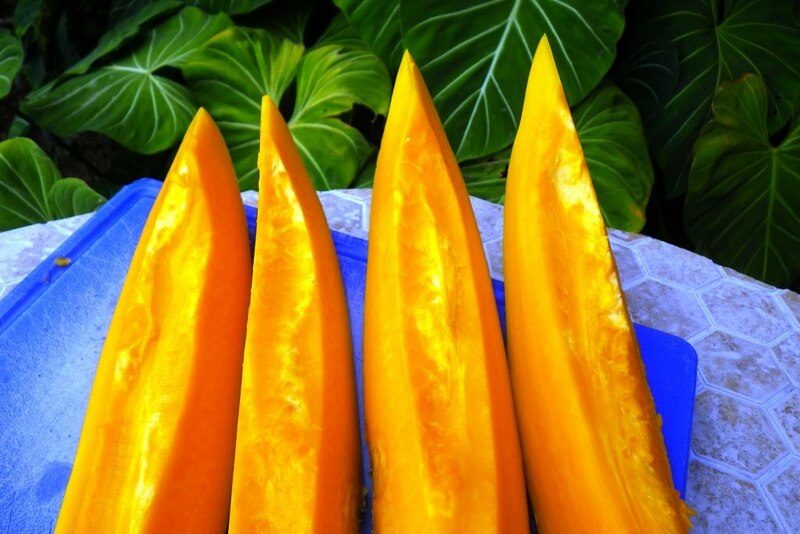 Hawaii is the top global exporter of the papaya, but did you know that it was originally imported? Papaya trees are indigenous to Central America, where they were called “ababai” — that’s where the name “papaya” came from!When the colonizing Spanish and Portuguese arrived, they fell in love with the fruit and brought it all over the world. As it turns out, Hawaii is a great climate for papaya-growing — you can buy fresh papaya all year-round! Nearly all the papayas sold in the United States are grown on the northern end of the Big Island. 2. Slice the halves again length-wise, to get long strips. 3. Make 8-10 cuts in the strip, almost to the skin. 4. Serve on a plate with a spoon and a slice of lime. Each person first squeezes the lime onto the papaya — trust me, it’s delicious! — and then scoops each square off and into their mouth. 1. Use your nose! The best way to tell if a fruit is ripe is to smell it. Does it smell sweet? Does is make your mouth water? Then it’s ripe! If it smells tart or (worse) like nothing at all, then put it back and find another. 2. Color. The best Hawaiian papaya should be mostly yellow. A little green is okay, but brown means that papaya has gone south. 3. Touch. How do you want your papaya to taste: Crunchy or soft? Soft! So squeeze the fruit gently to test it. Don’t squeeze too hard, though — a ripe papaya can be easily bruised. ❀ Skin and half a papaya, then chop it up and serve it on spinach salad. Healthy and delicious! ❀ Put papaya in a fruit smoothie — you won’t need any sugar! ❀ Serve papaya salsa with your grilled tuna. Mmmmm. Here are a few papaya recipes to get you started!